This page includes some of the terms you'll encounter if you're unlucky enough to be trapped on an elevator full of reel collectors. If you have questions about other terms, feel free to e-mail me. A reel designed to wind in line automatically, either when the angler moves a lever or when a fish is hooked. A reel with a spherical counterweight on its counterbalanced crank. These cranks usually are found on "New York-style" reels. Believed to have been invented by John Conroy during the 1830s, they were used for the next 60 years or so by many manufacturers. Any relatively large reel designed for salt-water trolling. Usually an older, light-weight reel with a spool made of wire. The spool often is donut-shaped. The term also is applied to reels whose sideplates and spools have large cutouts that help ventilate the line. See "skeleton spool." A mechanism that interrupts the drive train between the crank and the spool of a multiplying reel, thus allowing the spool to rotate with as little hindrance as possible. Reelmakers have been equipping their products with an amazing variety of clutches, both manual and automatic, since 1856. The term used to describe a crank, curved or straight, that extends in only one direction from the crankshaft and, therefore, lacks a counterbalance. A single-action, large-diameter, narrow reel with forked "spokes," around the ends of which the line was wound. The earliest examples patented in the U.S. were made in Indiana. The makers believed that the large diameter permitted rapid line retrieval without multiplying gears and that the narrow spools facilitated thumbing during the cast. Usually a casting reel hand-made by one of about two-dozen makers in Kentucky known for the quality of their reels. Many collectors specialize in these reels, which are considered among the finest ever constructed. The reels were made from about 1815 to 1940, and the styles included fly reels and salt-water reels by the end of the 19th century. Any reel with a gear train that causes the spool to rotate faster than the crank. It is believed that the first multipliers were made in Great Britain, probably after 1750. An older, heavy, relatively simple multiplying reel characterized by its use of a counterbalanced crank and, sometimes, swivelling disks protecting the spool bearings. The disks facilitated oiling. The style seems to have originated with manufacturers in the New York City area. Some collectors reserve the term for reels with "S"- or "reverse S"-shaped cranks, but others use it more generally to include "ball-handle" reels and even single-action reels with qualifying cranks. This photograph shows the terminology used for the major parts of fishing reels. A reel with peripheral "ears" or extensions on its sideplates, to which the frame pillars are attached. The design permits more line to be wound on the spool than circular plates of the same diameter would allow. Huge numbers of reels with raised pillars were manufactured between approximately 1870 and 1930, in a wide range of styles and quality. A reel with its foot on the "side" of the reel frame. Though most reels are mounted upright, many old single-action and automatic reels were side-mounted. Jim Schottenham's website is packed with photos of classic side-mounted reels and histories of their makers. Any reel whose spool rotates at the same speed as the crank, as its speed is not multiplied by gears. 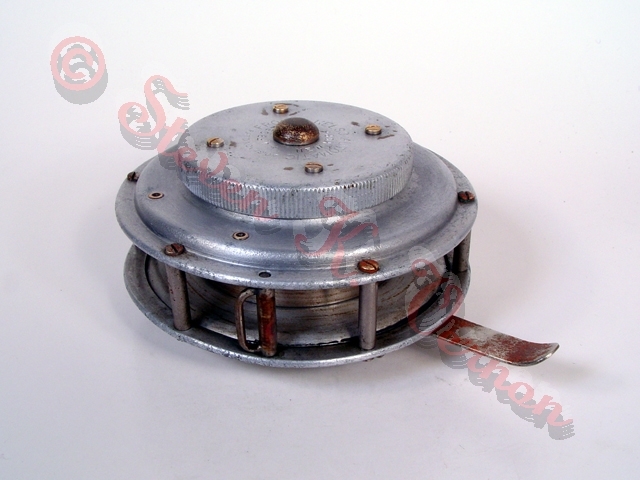 A light-weight spool made of wire or highly perforated sheet material (metal or rubber). These spools usually were used in "cage reels." A casting reel whose spool does not rotate during casting because its axis is parallel to the rod. Also called "fixed-spool" reel. It may surprise many novice collectors to learn that spinning reels have been in use for more than a century.